This article intends to serve as a guide to help you determine if a parrot is the right kind of pet for you. We will look at a number of issues that need your serious consideration before you get a bird. 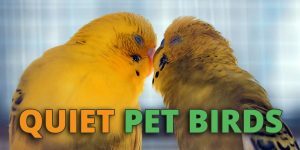 After determining that you are going to go ahead and obtain a parrot, we will examine some specific types of birds and issues related to living in harmony with your avian companion. We will attempt to help you make a good choice as to which kind of bird will be best for you. Where Should I Obtain My Parrot? Good Luck With Your New Parrot! Here are the main issues that owning a parrot may present. We are not trying to talk you out of getting a parrot, but simply pointing out aspects of living with a parrot that you may not have thought about. One of the major factors to consider when introducing a parrot into your home is your family’s tolerance for noise. You also may need to take your neighbors and living quarters into account when making your decision. Apartment dwellers may have to refrain from obtaining certain species of birds. Night workers may have difficulty co-existing with parrots. 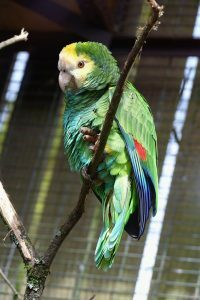 All parrots can get noisy, though there are some that are quieter than the others – see our detailed article here for a list. Even the smallest parrot can occasionally give off a loud call or scream. This is normal behavior that is to be expected. Parrots that are not cared for properly and given enough attention can also develop a habit of excessive screaming. All parrots have hook-bills that can potentially be used for biting. As a general rule, the larger the bird, the bigger the potential for an inadvertent injury. Even a very tame bird can be startled and react instinctively. This can be a factor for families with children who may be too quick-moving for some species of parrot’s temperament. More information on how to prevent parrot biting is available here. Your parrot may develop too strong a bond with you that causes it to be jealous of others and resort to biting. Proper socialization with others can help minimize the potential for this problem to develop. Parrots are considered companion birds, as they afford companionship to their owners. They also demand companionship and attention or they will suffer emotionally and resort to screaming or self-destructive behavior like feather plucking. They look for their owners to replace the flock that they would have in their natural environment. You need to be prepared to give your parrot some quality time every day. It may demand an hour or more of your time for out of the cage exercise, flying time, or just bonding. If you cannot commit to this type of arrangement your parrot will suffer mentally, emotionally, and physically. According to petcha.com, demands on their time is the number one reason people give up their pet parrots. In some cases, such as parakeets, keeping a group of birds can minimize, but not eliminate, the attention that you need to give them. They will find companionship in their flock. 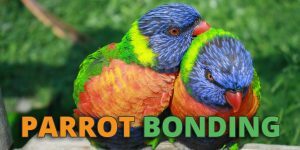 More details about parrot bonding are available here. Parrots live a long time. Even those with the shortest lifespans in captivity still can live for over 15 years. The longest-lived parrot species can live for well over 50 years. 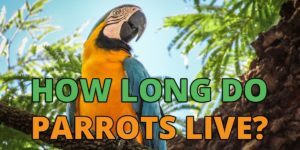 See a full list of parrots lifespans available here. This is not a commitment to be taken lightly. Your parrot will bond with you and your family for a large portion of your life. Though unforeseen circumstances can occur, it is not fair to the animal if your intention is to only keep it for a short time. Puppies aren’t just for Christmas, and neither are parrots. You need to take into consideration the makeup of both the human and animal members of your family. Small children, cats, dogs, and other parrots may all pose challenges when you are thinking of adding a parrot to your household. Some prospective pet parrot owners have unrealistic expectations regarding the abilities of their chosen parrot. You should not choose the species of parrot with the expectation that it will be a great talker or be able to perform a litany of tricks. Your bird is an individual and may not achieve the same level of mastery in these endeavors as some others of its species. 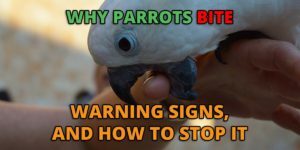 These factors which may negatively affect your decision to obtain a parrot are not meant to scare you away, but to give you an idea of what owning a parrot really entails. Adding a parrot to your family is not a step to be taken lightly. Let’s take a look at some of the factors that will help narrow down the kind of parrot that will work best for your home and family situation. Below is a video that shows details pertaining to some of the most popular breeds of parrots. Here we are talking about both your living arrangements and the space that you can afford to devote to your bird. This will help determine the noise level and size of the parrot you choose to obtain. If you live in an apartment then you cannot seriously consider the larger birds. 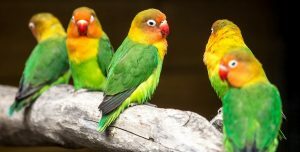 Even small parrots such as some species of conures can be very loud, making them inappropriate for keeping in an apartment. You need to stay with quiet birds like budgies, parrotlets, Meyer’s Parrots, and Senegal Parrots. Noise levels may be a consideration even if you do not live in an apartment. Not everyone can handle hearing a cockatoo’s daily ear-piercing calls. Below is a video demonstrating what to expect with a pet cockatoo. Parrots need 10 to 12 hours of sleep every night. Ideally, you have a quiet room where your parrot can sleep at night. During the day, it may stay in this room or move around the house to be in proximity to the human activity. 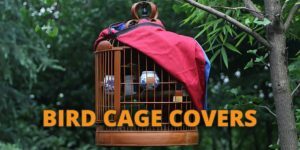 To aid in the sleep of a pet bird you may require the purchase of a bird cage cover. You also need to have a safe place for your bird to come out of the cage daily for exercise. Perhaps you can have a dedicated bird room where all of its activities can be accommodated. You might have to have a sleeping area and a daytime area, depending on the space available. In any case, you need to plan how you will provide for these needs of your bird before you bring it home. The size of the space you have will also have an impact on the kind of parrot that fits best in your home. The difference in size between a cage for a macaw and one for a conure is considerable. So is the space needed to properly exercise the bird, especially if you are allowing it to fly freely. 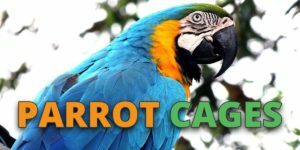 Here is a great parrot species chart put together by parrot-and-conure-world.com that can help narrow down your choices. It talks about the noise level, size, and some other characteristics of many popular parrot species. There are initial costs in owning a parrot. Obviously, the bird itself comes with a cost, even if it is just an adoption fee at a local parrot rescue facility. The main cost of a parrot varies depending upon it’s species. A good guide to the prices of different species is available here. Then there is your bird’s first cage and all the accessories that make it a suitable place for your avian companion to live. Over a long lifespan, a cage may have to be replaced several times. Food, toys, and treats can add up to a significant bill over the course of a year. You may also need an additional travel cage in case of visits to the vet. Now for the more extensive and expensive portion of keeping a parrot. 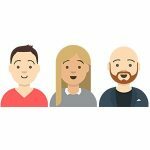 The costs of long-term care and feeding will be considerably more than your initial investment. 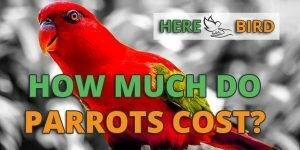 Depending on the size of your parrot, food costs can range from under $20 a month to well over $100. If you have a large bird or one that is particularly destructive with their toys, that can lead to another fairly expensive ongoing financial outlay. Toys need to be replaced for your parrot’s mental well-being. Vet bills and grooming such as beak or nail clipping can be another possible long-term expense. In addition to the financial costs, there are daily and weekly maintenance tasks that need to be performed to keep your bird healthy. Parrots can be messy, and they don’t clean up after themselves. The amount of time that you can devote to your bird’s care is another factor that needs to be considered when deciding between different species of parrots. IF you are at work most of the day, then you want to get birds that can entertain themselves, and that do well in groups. Smaller parrots may work here, and they can be housed together and give each other companionship during the day. If you are considering an African Grey or another larger parrot that will benefit from more interaction between parrot and human, you want to make sure that your lifestyle will accommodate the time you need to spend with your bird. Perhaps you work at home or work in an environment where your parrot can accompany you daily. This kind of situation would be more in tune with a larger, more needy bird. The other members of your family have an influence on the type of parrot you should consider adding to the mix. Smaller, more docile birds are more suitable for families with small children. That is not to say you can not have a larger parrot, but you will need to take precautions while the children are very small. If you have other animals then you need to think about how they will interact with your parrot. You will need to be able to separate your other pets, such as dogs or cats, when your bird is out of its cage. In the case of other parrots or birds in the home, you also need to look into the compatibility of various species. A general rule is that when housing birds of different species, size and especially beak size should be similar to avoid injuries. After deciding on a species of parrot, the next question becomes where is the best place for you to obtain your parrot. 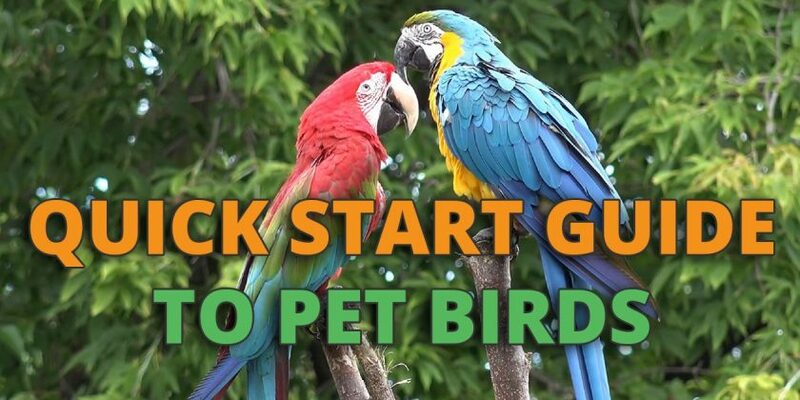 The most basic choice here is whether to purchase a bird or adopt one from a parrot rescue organization. 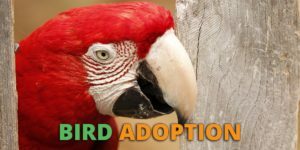 When adopting, you will in all likelihood get a parrot that is fully grown and may have some entrenched behavioral issues that will need to be overcome as the bird learns to live with its new family. The problems associated with adopting are tempered by the knowledge that you are rescuing a bird and giving a second chance to have a good life. Our guide to bird adoption is available here. If you choose to purchase a bird, the best direction to go is with a legitimate bird breeder where you can be reasonably sure that the bird has been handled correctly up until the time that you receive it. Smaller species can often be obtained at quality pet stores as well. Now that you have carefully considered the pros and cons of parrot ownership and decided to take the plunge, hopefully, your bird is everything you expected it to be. Good luck as you begin what can be a long and happy relationship for both you and your parrot.